**New for 2017-2018** Shark introduces the new ION 750 Robotic Vacuum with Dual Brush edge cleaning to get debris from edges and corners. This model is great for pets and pet hair with its Self-cleaning Brushroll which removes short and long hair, dust, dander, and allergens. The ION 750’s HEPA filter helps to keep the air clean while it is vacuuming. The Dual spinning side brushes will pull in dirt and debris from corners and edges. The Robot Vacuum has full navigation sensors for cleaning carpets and floors. 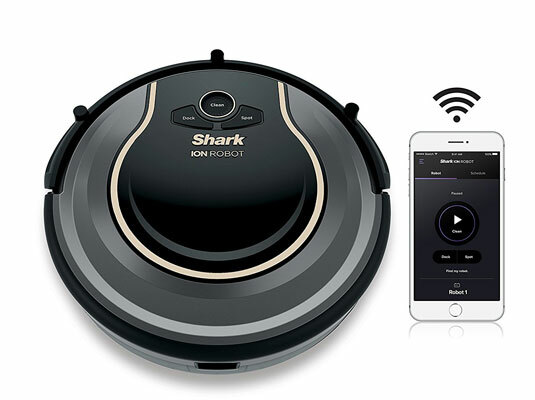 The Shark ION 750 starts working for you at the push of the CLEAN button (on the top of the vacuum) or use your Smartphone, as the ION 750 has built-in WiFi. You can also schedule cleaning for later with your Smartphone or Tablet. The 750 model can also be voice controlled with Amazon Alexa & Google Home. The Shark ION 750 will give you about 1 hour of cleaning time, and automatically returns to its charging base. On-Board Scheduling: The Shark ION 750 can be scheduled to perform up to seven cleaning sessions per week, even when you’re not home. Smart-Review Commentary: The Shark ION 750 is one of two new Robot vacuums introduced by Shark. This model has built-in Wifi and can be Smartphone controlled with the available Shark ION ROBOT APP, while the other Shark model 720 is controlled by an included remote control. The self cleaning brushroll can also be easily removed by turning over the robot vacuum and removing it to clean. Cleaning time is approximately 1 hour according to Shark, and the charging time is 3 hours. The ION 750 automatically returns to base to charge. The Robot comes with BotBoundary strips, which you can place at areas that you want to block the robot, such as at the doorway, or under beds & furniture. Self-cleaning Brushroll which removes short and long hair, dust, dander, and allergens. The helix-pattern bristles provide for pickup on both carpets hard floors. Smart Sensor Navigation directs the robot vacuum over your carpet and floors. This first generation robot vacuum from Shark has received high consumer reviews. The Shark ION 750 model is a Smart-Review top pick for robotic vacuums and a great value. Description: The Shark Ion 750 robot vacuum comes with a self-cleaning brushroll, and HEPA filtration. 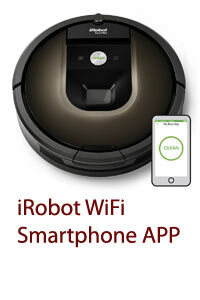 This well rated robotic vacuum comes with WiFi Smartphone control to program and run the vacuum. Bot boundary strips keep the vacuum from entering a specific area. This model is a SmartReview.com top pick.